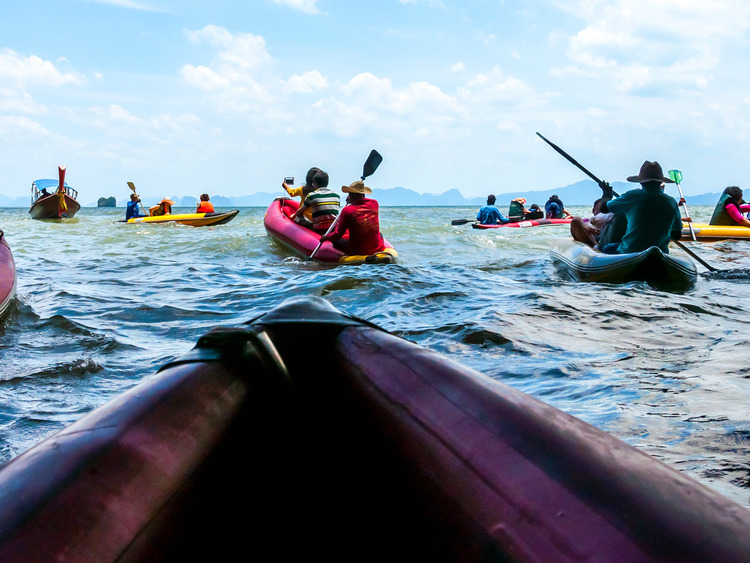 A thrilling canoe experience in Phang Nga bay, where we can admire stunning natural scenes and take in the breathtaking sunset over the sea as we enjoy dinner on our boat. After leaving the port, our coach will take us to Por Bay, where we will enjoy a **marvellous boat ride in Phang Nga Bay with its spectacular nature, lush mangroves and limestone rocks eroded by the sea. Our boat cruise will take us to the island of Koh Panak, where cliffs covered in tropical vegetation conceal some stunning interior lagoons. We will experience the thrill of exploring the island in a canoe, passing natural landscapes dotted with caves, stalactites and stalagmites. Then we will return to our boat and be lost for words as we admire the sunset painting the horizon pink as we are served a buffet dinner of typical Thai dishes. Meanwhile, we will head to the harbour from where we will set off on our return journey to the ship. We recommend that you wear comfortable shoes and clothes and bring a change of clothes. Do not forget to bring swimwear, a towel, sunglasses, a hat, sun cream and insect repellent. Capacity per canoe: 2 people. Waterproof bags for cameras and video cameras will be provided on board. In some parts of the cave where the cave ceiling is very low, we will have to lie down in the canoe for a few moments. The presence of many bats in the caves may cause unpleasant smells. For safety reasons, the visit to the caves is subject to the tide. To reach the beach it is necessary to bathe up to the knees due to the absence of docking area. The last part of the excursion will take place in the evening. ?